We are no one. Names and faces are dust and shadow. In 2007 we formed in the deep west of Germany to rule, to burn the dancefloor. 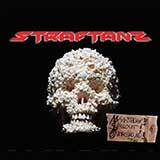 We are Straftanz. We scream freedom, yet we are unfree. We are people without morale and discipline, yet you adore us when we sagaciously state the wrong. We are the soft concrete that offers good rest for your weary brains. We piss on graves to show you that parables are sometimes parabolic. We do not care for the cave paintings on the faces of the elitists. We set words to march in rows and hide explosives in between them. We know that hand that held the chisel, but that does not mean that those words engraved in stone still have meaning for us. We steal from the strong, because we know: It is not about where you take it but about where you take it to. We feel part of a culture that is not "sub", but we do not feel rotten enough to drop any dogma without second thoughts. The elite tremble in fear, even though they still have no idea what we hung up above their heads. We are not crazy, not wise, not original, not ironic and we are not abstract. But we will drown your Hierarchies in sweat.